Join us as we chase the Leprechaun during the 4th Annual St. Paddy’s Day 5k Run/Walk on Saturday, March 16, 2019. 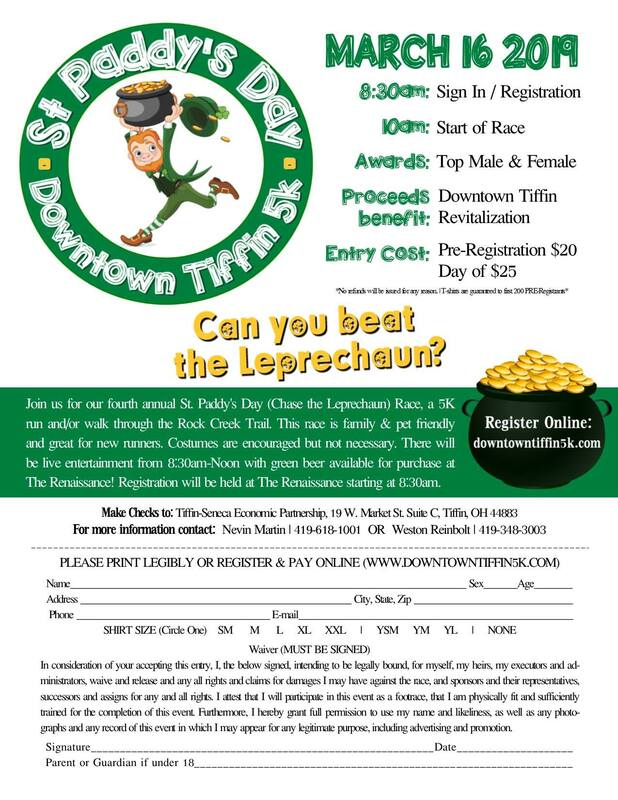 The race will start promptly at 10:00 am with registration opening at 8:30 am at The Renaissance in Downtown Tiffin. Yes, there will be a speedy leprechaun in the race. The leprechaun will start after everyone else has begun, giving you a generous head start. Costumes are encouraged! Proceeds to benefit Downtown Revitalization in Tiffin. **Children 10 & Under are free and have the option of purchasing a shirt for $8 at the pre-registration link. The 3rd Annual St. Paddy’s Day 5k Run/Walk was held on Saturday, March 17, 2018. Pre-registration was $20 and included a t-shirt, day of registration was $25. Children 10 and under could run for free. Over 300 registrants participated. The race started at The Renaissance downtown. Following the race, participants had the opportunity to enjoy a festive drink in celebration of crossing the finish line and St. Patrick’s Day of course!